A blood-stained woman is arrested in front of a palatial home in a wealthy part of Montréal. She has just fired a hunting rifle at the house. Suffering from shock, she retreats into obstinate muteness. That night, the police discover her husband’s body in her house. An investigator reconstructs the sequence of events. A switchboard operator for twenty years, Réjeanne (Guylaine Tremblay) loses her job when the multinational she works for announces massive layoffs. That year, the company president received a salary of 13 million dollars. 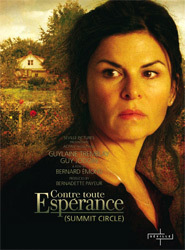 Soon after, Réjeanne’s husband (Guy Jodoin) suffers a stroke that leaves him an invalid suffering from aphasia. Gilles and Réjeanne can no longer make ends meet and are forced to sell their comfortable suburban home. They move back to the city, taking a small apartment in a run-down area. To support her husband, Réjeanne takes low-paid dead-end jobs. Despite Réjeanne’s love and devotion, Gilles retreats into himself and falls ever further into depression. Then one day, everything changes. Released with English subtitles as Summit Circle.